Today was one of those days that will go down in history, it will be noted forever on this blog and in my checkbook. Why you might ask, why is today so special? Because I wandered into perhaps the very best Stamp/Scrap/ Studio in the entire Bay Area. Scrap Lovers and A Work of Heart are located in San Jose, 2196 Lincoln Avenue, and run, don't walk, don't stop, RUN to their amazing store and see for yourself why I was there for over an hour and could have stayed even longer. Andrea and Christina, the store owners, have a give away up on their blog, go over there and post a comment and you might win a really cute stamp set, and if you are so inclined, let them know you found them via AfterHoursStamper. You don't live in San Jose? No worries as you can visit their online store for an amazing selection of goodies, and good prices to boot! 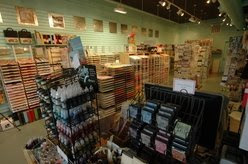 Scrap Lovers is what you dream a stamp/scrap store should be: stocked with just about everything that you would want or need for your projects. For example, they stock and carry stamps from over 30 companies. Yes, you read that right, 30 companies. Hero Arts, Tim Holtz, Technique Tuesday, you get the idea, and again, if you aren't in the Bay Area, then visit their online store to see what I mean. Or sign up on their Message board/Community to share your ideas with other stampers. So, you wander into their store and right away you know, you feel, that this store is what you have been looking for all your life. I have never gotten that feeling at Michaels (or the "M" store as some say ; ). Need glimmer mist? Paper? Distressing ink? Chip Board? Grunge Board? The newest and latest stamps, mounted and unmounted? Do you need embellishments? Tools? Markers? Rub ons? It is all here, and more. If they don't have what you want, talk to them and see if they can order it for you. The two owners, Anrea and Christina are just wonderful, they are not only helpful, they are talented crafters who love what they do and excel in their knowledge of techniques and tips. If you live in the Bay Area, you really have to visit their store, because not only can you buy things there, they have a studio that you will just drool over! The "store" is on one side of their space, and the studio takes up the other half. The studio has classes, camps and meetups scheduled all the time, here is a link to some of their upcoming events, and if you want to experiment with all sorts of materials, tools and techniques, schedule some studio time for $7 an hour which includes materials,(scraps galore to use, full sheets of paper are extra, as are a few other supplies) tools, and equipment (for $50 you can get 10 hours of studio time). If you so desire, you can even book a party there! While I was there today a woman came in with her daughter and they had scheduled time to make the little girls birthday cards in the studio. Upcoming events include an Art Metal workshop, Kids Camp, monthly ATC and cardmaking meet ups, just a whole lot going on in this studio. So, if you live in San Jose or near here, it is worth your while to come and visit this great shop and studio, let the owners know that you found them from this blog, and if you don't live around here make sure to visit their online store for great deals and a HUGE selection of products. Andrea and Christina, YOU ROCK! And aren't you glad I finally went home? Awwww Shux, I was just there last weekend for a babyshower too! I guess I will have to go back as I used to live there 20 years ago, Christina A.